Having pushed its benchmark rate to a 10-year high, Banco de México has run out of room to match hikes by its northern neighbor, analysts say, and with inflation easing, is set to diverge its monetary policy from that of the U.S.
Over the past year, Banxico has largely matched rate policy changes by the U.S. Federal Reserve. That level of parallelism is broadly a reflection of the economic ties Mexico has with the United States. The U.S. is the Latin American country's largest trading partner, accounting for more than 80% of its exports and nearly half of its imports. Economists had thought that the October 2018 resolution of the tri-lateral trade talks among Canada, Mexico and the U.S. — replacing NAFTA with the new USMCA trade deal — would offer Banxico the ability to break its monetary policy link to the Fed and lean its decisions more heavily on domestic data. In a note posted shortly after the agreement, ING called the new agreement "the final greenlight" for the Mexican central bank "to decouple its monetary policy decisions from the U.S. Fed," predicting a "hawkish hold" on rates. 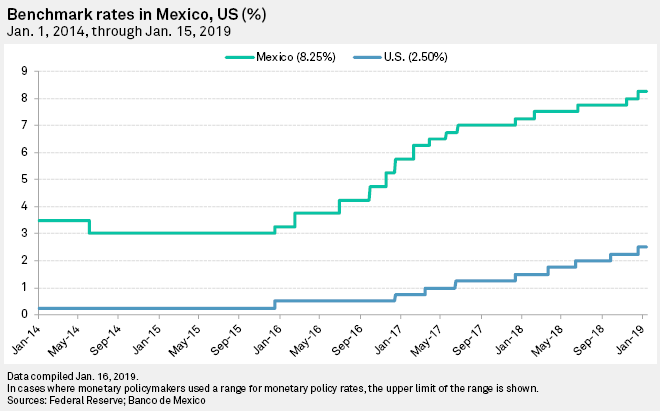 But in the months since, Banxico hiked rates twice more, including most recently in December 2018 following the Fed's own quarter-point hike. The Mexican benchmark rate now sits at 8.25%. The central bank has more recently signaled it will no longer follow the Federal Reserve as closely. Its 2019 calendar will have the monetary body meet eight times over the year, with only three of those events — in February, March and December — occurring in close proximity to the Fed's own rate decisions. "The monetary policy stance is quite tight now, and so we think they are pretty close to the end of this cycle," Charles Seville, head of North America sovereign ratings at Fitch Ratings, said in a telephone interview. Seville noted that Mexico's current inflationary trend supports a rate hold for now, and potentially a gradual reduction down the line. Inflation ended 2018 at around 4.90% and is expected to ease to 4.50% by the end of 2019, according to estimates from the Economist Intelligence Unit — sharply lower compared to the 2017 pace of 6.04%. 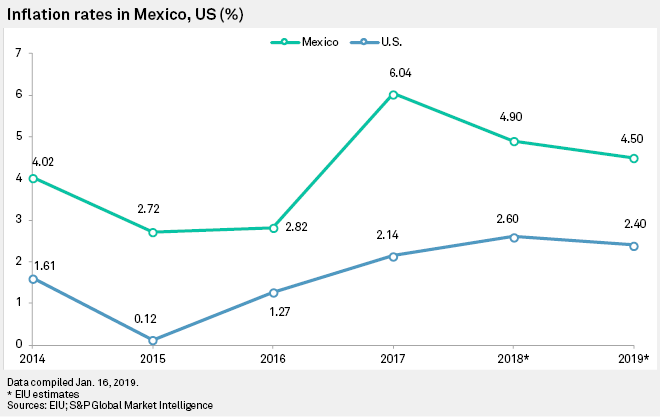 A recent fuel shortage in Mexico — spurred by a government crackdown on fuel theft — and the recent strengthening of the peso could also reduce inflationary pressures, the Fitch analyst added. Some analysts believe that rates could start to come down as early as year-end, though reductions are seen as more likely in 2020. In a recent outlook report, FocusEconomics said an average of expectations from its panel of analysts' have the benchmark rate at 8.11% at year end, and down to 7.24% by the end of 2020. "Most analysts expect the fourth-quarter hikes to be sufficient as calmer heads prevail; they do not expect any more hikes in 2019 ... a growing number of LatinFocus analysts now see rates [remaining] elevated through next year in response to pass-through pressures from the peso," FocusEconomics wrote. Still, economists note that Mexico's central bank could take a less-hawkish stance should the country's new left-wing president, Andrés Manuel López Obrador, prove capable of maintaining a stable economy. The president, who took office at the start of December 2018, roiled markets early on by sending mixed messages about how he would govern. His decision to scrap a major airport project in Mexico City particularly rattled investor confidence, and spurred Banxico itself to voice concerns over the country's future economic policy direction. However, his administration has also put forward an annual budget proposal that was widely hailed as "realistic" and "fiscally responsible," broadly maintaining the prior government's fiscal targets. The budget targets a primary surplus of 1% of GDP this year at the public sector level, up modestly from an estimated 0.7% in 2018. The change would be driven by a 6.1% growth in government spending and a 6.3% increase in revenue. "If met, these targets should be enough to sustain debt-to-GDP at around 46% for the public sector and 35% for the federal government, supporting the sovereign's credit profile," Moody's said report. "That could provide some scope for monetary policy to be loosened," Fitch's Seville said. The budget proposal could signal that, despite his ambitious social project plans, the new president is keenly aware that he has limited capacity to add to Mexico's already elevated national debt, Jorge Sánchez Tello, an economist at Mexican financial sector research institute FUNDEF, noted. "This government knows it cannot play with the debt situation and has little space to do so without pushing rates up at Banxico," Sánchez Tello said. "And that would anger people." Enjoyed this analysis? Click here to set-up real-time alerts for data-driven articles on any region of interest.